Anyway. While I was pondering and muttering, a bit o curd escaped to be eaten with fresh fruit. We can now accurately report that lemon curd goes beautifully with fresh nectarines, blueberries, and blackberries. But still, there’s so much left. I tried a muffin recipe with curd in the batter, but something was seriously off with *that* recipe. Muffins shouldn’t bounce, should they? I didn’t feel like trying to solve for it, so I threw the yellow superballs away and came back to the internet. 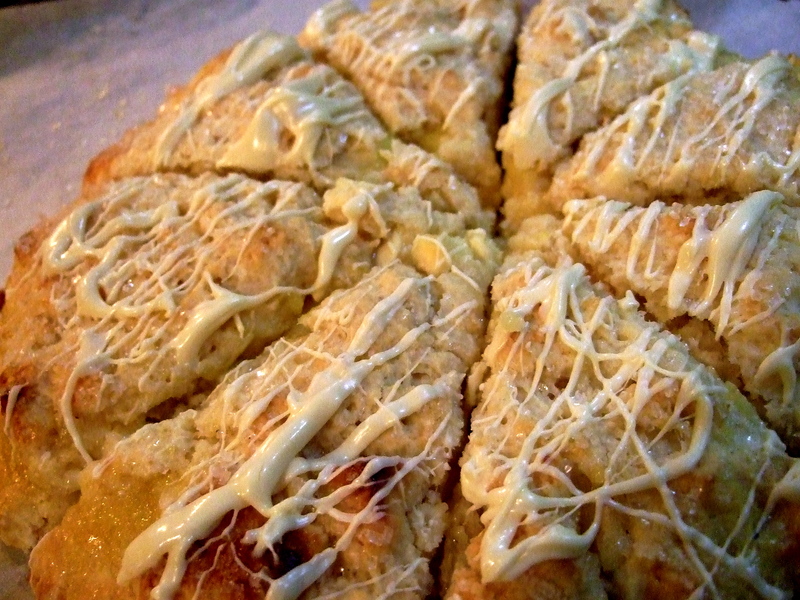 And that, my friends, is where I found this amazing recipe – Lemon Curd and White Chocolate Filled Scones, from Diana’s Desserts. I’d never been to her site before, so I was a little hesitant (especially after the muffin fiasco), but figured what the hell, and started baking. Oh my, these are delicious. REALLY, really delicious. Even though we know better, we couldn’t help ourselves and tried to eat the first one just moments after taking it out of the oven. Helpful hint – don’t try that at home. While tasty, you’ll be slightly distracted by the piping-hot filling burning a hole in the roof of your mouth. Split the second one the next morning, and realized that patience is a virtue. Now that they had cooled, and the flavors had a chance to meld, the true beauty of these scones was trumpeted to the universe. The subtleness of the sweet white chocolate chunks in the dough, combined with the tartness of the curd layered in the middle, was just complete heaven. I highly recommend this recipe, and mrslovey’s coworkers (who got the remainder) agree. It was fairly easy, if a hair messy (trying to seal the dough without squirting curd everywhere was fun). As for the remaining curd, there’s not too much left. It will probably get made into another batch of scones, or be nibbled with fresh fruit, or both. Such a dilemma, I know. omg and i love lemon curd…but do i dare try this myself…btw your’s look BEAUTIFUL!!! Made my MOUF water. ..and of course I realized I never gave the actual curd recipe. I’ll dig it out and post it tomorrow. good GOD those look amazing!!!!!!! what’s the frosting drizzled on top? white chocolate drizzled on top! I wish I was one of your co-workers…I never get to try your stuff.